No oiling, less cleaning, more reliability and better filtration. What more can you ask for? If desired, you can simply clean your PowerCore Filter with a shop vac. Keep in mind, maintenance is not required for 100,000 miles! 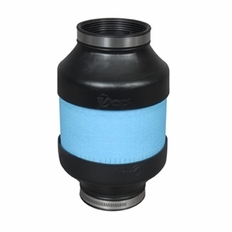 You won't have to worry about oil from your filter causing problems with your mass air flow sensor with this DRY filter either. -Flange I.D - 3.5" to 3.5"